Germany’s Reduction Engineering, an allied company of US-based Reduction Engineering, is presenting cantilevered strand pelletisers from CF Scheer, having acquired its pelletising division. The latest SGS-E6 series is now available with working widths of 100, 200 and 300 mm. 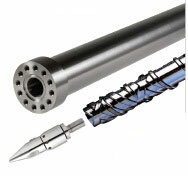 With its improved cutting geometry, it minimises the unguided length of the strands between the feed-rolls and the cutting edge and extends the processing range, especially when processing very soft and/or elastic materials, with strand speeds up to 120 m/minute (with and without adjustment of the pellet length). At Fakuma, it will launch SGS 100-E6, with maximum 20 strands and capacity of 550 kg/hour. Italy-based Moretto will present what it says is a world first of its kind, the new inline MoistureMeter, placed right above the feed zone and close to the plasticising screw. It is said to offer processors reliable inline measurement of the residual humidity including instant optimisation through feed-back signals to the closed-loop control system of the upstream polymer drying equipment. Wittmann has combined the advantages of its Feedmax S3 net single loader with those of the Feedmax B200 central material loaders to offer the latest Feedmax B203 net. This practical, newly designed appliance with the appearance of a single loader has been equipped with highperformance blowers, so that it can reach a higher material throughput and handle material conveyance over longer distances. Germany’s ProTec will introduce the new Somos T140 eco auxiliary dryer with its updated design; and following the recent acquisition of PolymersNet will present the LFT (long-fibre-reinforced thermoplastics) systems platform. The T140 dryer provides hopper volume of 400 l and dry air throughput of 140 cu m/hour, a distinct step up from the five previously available auxiliary dryers with volumes ranging from 30-300 l. It also features an updated touchscreen controller. Coperion and Coperion K-Tron will present the T35/S60 quick change feeder, specially designed for applications requiring the maximum possible material handling and changeover flexibility, together with a 2400 series pellet receiver, a high capacity sequencing system designed to handle powder, pellet, regrind and granular materials. It will also show ActiFlow smart bulk solids activator that prevents bridging of cohesive bulk materials in stainless steel hoppers without internal hopper agitation. Meanwhile, Coperion K-Tron’s bag dump station with integrated dust hood is specifically designed to maintain a clean, dust-controlled process environment; the unit is equipped with a pulse-cleaned cartridge filter. Maag Automatik will present a revolutionary process for pelletising, Optimised Temperature Pelletising (OTP), a void-free approach to pelletise technical thermoplastics with Maag’s Sphero underwater pelletising system. 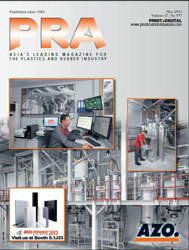 It can cover the entire process from plastic melt to finished high quality pellets. Another focal point in the booth is the new generation pump, 6 extrex, offering up to 50% higher flow rate on comparable products. Ettlinger Kunststoffmaschinen will show the recently launched Eco melt filters. Specially developed for film and sheet extrusion, the melt filters are rated for a maximum contaminant level of 1.5% by weight, enabling cross-linked and high-molecular fractions contained in the melt to be removed when processing virgin material along with any gels or partial impurities. The company has already installed 225 units of the equipment. Laser welding specialist LPKF is highlighting its compact welding InlineWeld system that can be integrated to save space in production lines. The standalone units of the PowerWeld line are all-rounders, suitable for all production configurations. Depending upon handling and laser source, they can be configured for small, medium or large series production runs. The PowerWeld 2600 has a rotary table while the TwinWeld3D is a robot-assisted hybrid welding system designed for welding large 3D free form components in thermal fields. Nordson Corporation will launch the Xaloy PC Molding System to address common challenges in moulding optical-grade polymer by delivering a homogeneous melt with a minimum level of the shear that can cause yellowness or discolouration in PC; and by avoiding polymer sticking points or “dead” spots where blemishes such as black specks can form. Nordson recommends the system for processing lens-grade or coloured PC for automotive lighting, eyeglasses, optical discs, and electrical and telecommunications components. Mold-Masters’s Summit series hot runner line is said to have four times less thermal variation from set point, compared to the typical thermal variation seen in a nozzle with a heater band. The cleanroom-ready tooling is built completely from stainless steel, which makes it ideal for moulding shear and temperature-sensitive resins like PC, POM and PBT. The nozzle profile positively affects balance and is especially effective for medical market moulding where precision is paramount. It can also be ordered with new servo-controlled valvegate actuators, which allow for individual speed, time and position control of each valve pin in the mould. 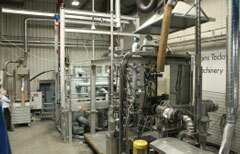 Swiss firm Beck Automation will launch the sideentry automated Beck-Flex IML system. Designed for 420-tonne moulding machines, Beck-Flex can decorate labelled lids and containers up to dimensions of 220 x 100 mm, with options ranging from flat labels, to three or five-sided labels, and five-sided labels with closed edges right up to 360° labels. Cycle times of around 4 seconds with an intervention time of up to 1 second are possible. At Fakuma, Beck-Flex will be shown on the Engel booth. 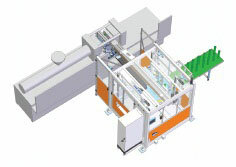 Wittmann will introduce its new pneumatic WP80 and servo WS80 sprue pickers, with the new Net8 control system. The WS80 is available in two different versions: either as a solution integrated in the Unilog B6 machine control system or as a stand-alone solution. The bestseller model W818, of which more than 5,000 units have been produced, has now become available with an extended axis, making it possible to combine it with a load-bearing capacity of 6 kg. French firm Sepro will have three new lines of robots for moulding machines with 800-5,000 tonnes of clamping capacity. It is also demonstrating a 7X55 five-axis robot from the new premium 7X Line and a Strong 50, representing a general-purpose line of large robots. At the same time, Sepro is introducing another three-axis family of robots for large-tonnage moulding machines: the technological S7 Line. Also on display will be a 6X90 six-axis articulated arm robot; 5X25, which is a smaller five-axis robot, and a Success 33 from the company’s universal range of three-axis robots. 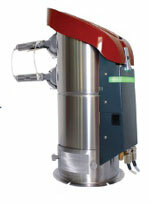 Sepro robots will also be on display on the stands of machine suppliers. In all, Sepro is exhibiting 11 robots at the show. Austria’s Erema will present the RegrindPro technology for the recycling of regrind material. Additionally, it will be presenting its brand new upcycling service for recycling and compounding with Corema. Recycling regrind as an alternative to virgin material has enormous potential for processors of plastics. 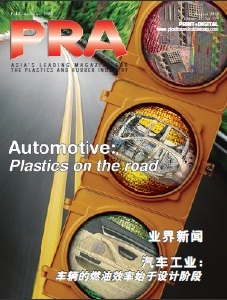 With raw material prices increasing all the time, the demand is growing more, especially in thick-wall packaging, electronics (WEEE) and automotive sectors. The thick-wall input material (HDPE, PP, ABS, PS), however, requires a specific treatment process which is designed to be able to handle mixed fractions with varying compositions, high bulk density and moisture, plus strong and varying contaminants through a very wide variety of impurities. The recycled pellets also have to meet exacting quality standards to be able to make end products from them with top surface quality and particularly high recyclate content. With the new Intarema RegrindPro, Erema has succeeded in developing a plant system which is designed exactly for these thick-wall materials. Thanks to extremely gentle processing and highly efficient filtration, the new system enables the recycling of regrind into application-oriented secondary raw materials. Around three years ago, Erema launched the Corema, a new product line which brings together for the first time all the benefits of recycling and compounding in a single processing step. Since the interest in this technology has grown since it was launched, Erema says that it will be offering customers its own upcycling service from autumn 2015. Erema will announce exactly what this new service includes and how customers will benefit from it in detail at Fakuma. Austria’s Next Generation Recyclingmaschinen (NGR) has designed recycling equipment for scrap production waste from PET injection moulded parts. Moulding PET causes the material to lose its IV-Value (Intrinsic Viscosity). Simple regrinding and introduction of this material will lead to receiving moulded parts with weaker material-degradation. The P:REACT series works according to the principle of LSP (Liquid State Polycondensation) and produces PET usable for 100% food-contact in accordance with FDA regulations. NGR will also show the A:GRAN (shredder-feederextruder combination), demonstrating how the PET melt preparation for P:REACT can be accomplished. 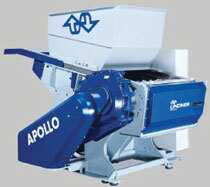 Lindner ReSource will introduce the new Apollo 1900 single-shaft shredder. Thanks to its extended rotor length of 1,900 mm, the system is suitable for high material volumes or for shredding large-sized pieces or baled materials. Across all machine sizes of the entire Apollo series the rotor diameter is a uniform 370 mm, while Lindner’s universaluse “profiled rotor” allows for moulded parts, tubes, shapes or film to be shredded, with the alternatively available “square blade rotor” developed specifically for shredding sheets and start-up lumps. The latest addition to Wittmann’s screenless granulators is the Junior 3 Compact model, a granulator designed for grinding hard and brittle materials. It fits in directly beside the injection moulding machine and is ideal for granulating sprues, which can be passed on to it by robots or conveyor belts. It can handle a material throughput of 7 kg/hour.